Despite the prominent addition of sharing features in iOS 6 and Mountain Lion, the company's concept of "sharing" is actually a narrow one. And in an increasingly interconnected era—when people are spending more and more time sharing words, images, files, and more with other people and among a variety of devices—that's a problem. Looking at iCloud in particular, it seems that Apple's approach to sharing is almost antithetical to the concept itself. The online service rigidly defines what you can share and how you can share it; its primary directive often seems to be to keep you inside Apple’s ecosystem. Indeed, Apple’s idea of making all of your files accessible to you from anywhere through iCloud overlooks two specific user needs: Sometimes you want to open files in multiple programs, and sometimes more than one person needs access to a file. It’s clear that Apple’s launch of iCloud has the classic idea of a filesystem squarely in its crosshairs. In the future, you’ll no longer have to create a complicated hierarchy of folders, to maintain multiple versions of the same file, or even to remember where your file is stored. Move it: You can store files in the big catch-all that is iCloud, but they become inaccessible from any other app. From Apple’s perspective, this is all about making things easier for the user. You no longer have to remember where you put a file on a disk; instead, all you have to remember is the app you used to create or edit it. After all, it's easier to remember that you were editing an image in Preview than that you saved it seven folders deep on your hard drive. I’ve certainly found myself relying more and more on the Open Recent menu option in apps that have it. Tying files to apps has its advantages, to be sure. But Apple's way of implementing has a cost: Sharing files between applications is more difficult and unwieldy now than it was before. Right now, files are associated with the programs that create them. That might be fine and dandy for apps like Pages or Keynote, which use their own proprietary format. But it quickly falls apart when you're working with more-generic file types, such as text, images, audio, and video, each of which can be worked on in a multitude of apps. For example, if you’d like to take a text file created in TextEdit and stored in iCloud, and then edit it in some other program, there’s no easy way to do so. No other program can see that data, either on the Mac or the iPad. In fact, no iOS program at all can see the files stored in TextEdit, because there’s no equivalent Apple text editor on that platform. The same goes for PDFs and images: You can save them in iCloud via Preview on OS X, but when you jump to your iPad or iPhone, those files are nowhere to be found. Undershare: Pages' Open dialog box shows you all your files created with that app, but not files from other apps that Pages could open, such as TextEdit. Of course, you could just email the file in question to yourself, and then use iOS’s Open In feature to launch the app you want to use. But you'd then have two versions of the file, stored in different locations, with no established relationship between them. If, after editing that file, you want to bring it back to the original application, you have to go through the email rigmarole again, creating yet another version of the file. That renders another of Apple’s clever filesystem tweaks—the Versions feature introduced in Lion—entirely useless. One solution might be to introduce an idea of private and public files. Private documents would still be limited to the current model of doing things, inaccessible to other applications without going through the above-described process. Public files, on the other hand, would be accessible to any application that could handle a file of that type. An Open dialog box for iCloud could display a separate list of files available from the other applications on your device. Regardless of how Apple solves the problem, make no mistake: It needs to be solved. While services like Dropbox, Google Drive, and Microsoft’s SkyDrive might be more complicated than what Apple hopes to offer with iCloud, all of them give you far more freedom to do what you want with your own files. And after all, they are your files, not Apple’s. There’s another facet to this sharing conundrum that’s no less significant. It’s about sharing files between people, not apps. Collaboration is at the heart of many personal and professional enterprises. Here at Macworld, for instance, we work together on articles, keep track of information in shared spreadsheets, and even occasionally make joint Keynote presentations. In Apple’s filesystem-less future, none of this is remotely friendly. Consider the workflow for a Keynote presentation that my colleague Lex Friedman and I recently co-created. Although writing an article together is simply a matter of firing up Google Drive and creating a shared document, if you want to create a presentation in Keynote, no equivalent method is available. Instead, Lex created the presentation file and saved it in a shared Dropbox folder. We then took turns—on alternate days—opening and working on the file. While one of us was editing it, the other would use Quick Look to view it from the Dropbox folder—without opening it, lest doing so might create some sort of conflict or data corruption. Even then, the file had to be re-Quick-Looked each time the Keynote file was updated. 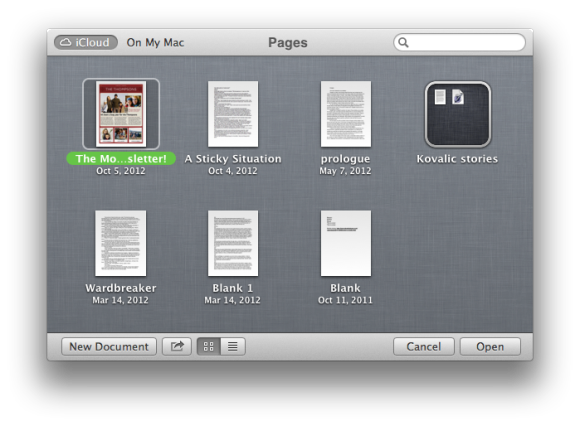 Unfair share: The limited sharing that iWork offers makes it a pain to collaborate on a file. Had we stored the file in iCloud, even this convoluted process would have looked comparatively simple. 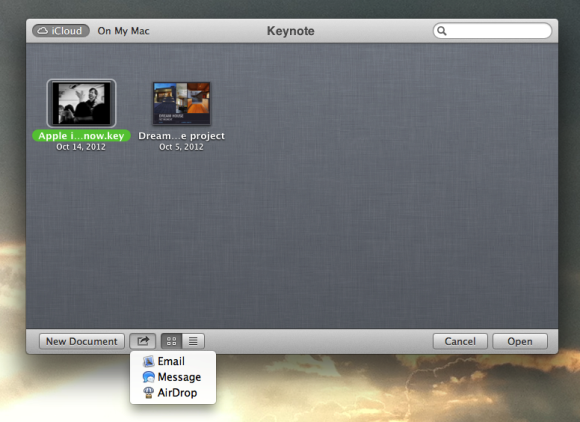 The only options for sharing a Keynote file stored in iCloud are via email, AirDrop, or Messages. Each time I sent it to Lex, he would have had to send it back to me after making his changes. That would have required me to add the file into iCloud again, yielding two versions of the same presentation: one before Lex’s updates, and one after. Since OS X Leopard, Apple has been diligently constructing a system of versioning and backing up files, yet somehow it has permitted this unholy mess to accumulate. As with sharing files between applications, the strengths of features like Auto Save and Versions go out the window when multiple users are involved, leading straight to a world where files have names like Apple_Presentation_version_3-Lex-final-really.key. Apple has dipped its toe into the collaboration pool in the past, most notably with the recently discontinued iWork.com public beta, but the support for sharing was laughable. Although you could let others view a file or add comments, there was no way for them to edit the content. In the shadow of relatively full-featured collaborative productivity software like Google Docs, iWork.com never had a chance to shine. 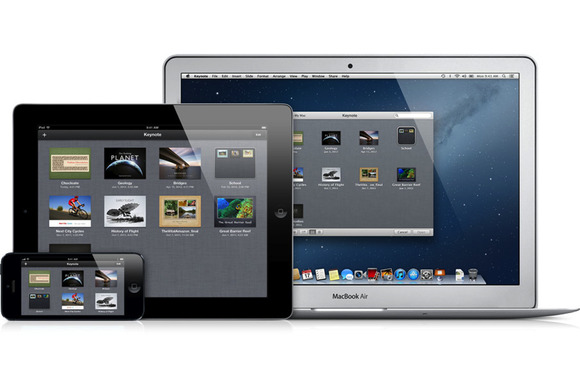 However, there’s a huge opportunity here, especially with iCloud now in the picture. Imagine being able to see other documents that friends or co-workers share with you, right in that same iCloud Open dialog box. You open a file and work on it, all of your changes are automatically saved and versioned so that when your collaborators edit it later, they’re sure to be working on the most up-to-date version. Apple could even go whole hog and support real-time collaboration, allowing you to see the changes your friends or co-workers are making as they make them. If the ID you use for iCloud happens to be the same one you use for Messages, you could add real-time chat—text, voice, or video—into the equation. Incorporating iChat Theater would let you demo a presentation to your collaborator as you worked on it. This isn’t exactly low-hanging fruit in the technology sense; such an overhaul would doubtless take a lot of work. But it might make Apple’s productivity software more attractive to both personal and enterprise users—especially if the company added support for collaboration between any combination of iOS devices and Macs. Third-party products like Simperium already offer many of these capabilities, but Apple could no doubt introduce an even deeper level of integration with its existing software. Apple’s iWork suite launched with a bang back in 2005 and was updated in both 2008 and 2009. Since then, however, it has languished, with only minor updates such as the recent 9.2 upgrade that brought support for iCloud itself. One way to add punch to a long overdue update—almost four years in the making—would be to focus on collaboration. Again, this is just one man’s take on a possible future. But as with sharing files between programs, Apple has given short shrift to document collaboration in the past. Google may have the headstart in that area, but it wouldn’t take much to provide some much-needed competition. And Apple is well positioned to do just that.